Redness after sunbathing or Solarium - not the most pleasant experience, so we learn to deal effectively with this problem and become owners of a beautiful bronze skin as quickly as possible! First, after tanning it is necessary to take a very cool shower. Hot water not only increases the redness, but also destroys the delicate natural protective layer of the skin. Do not use a washcloth or sponge, except that only nourishing and gentle shower gel (preferably ph neutral). Remember that showering after tanning - this is a mandatory procedure. Moisten and soothe the skin: first, the tan will last long only when well-moisturized skin, and secondly, after UV exposure your skin needs to urgently replenish moisture! Choose light creams or gels with natural extracts, such as chamomile, which soothes the skin and reduces redness. Do not use a heavy nourishing creams, they are unlikely to help hide the redness. Well, if you manage to find the funds with menthol that will cool skin and will effectively remove redness. If you feel that you burned, try to remove redness with the pulp of avocado and peach (although quite suitable and apricot) oil. They contain a huge amount of nutrients which will come to the aid of your skin affected by intense UV exposure. With potential burns and redness after tanning great fight various herbal extracts: sage, already mentioned above, chamomile, parsley and celandine. In addition, an excellent means is a brewed black or green tea, which need to soak cotton wool or gauze and apply on affected areas for about 20-30 minutes. The view that the Solarium can't be fired, is wrong. Unfortunately, very possible. 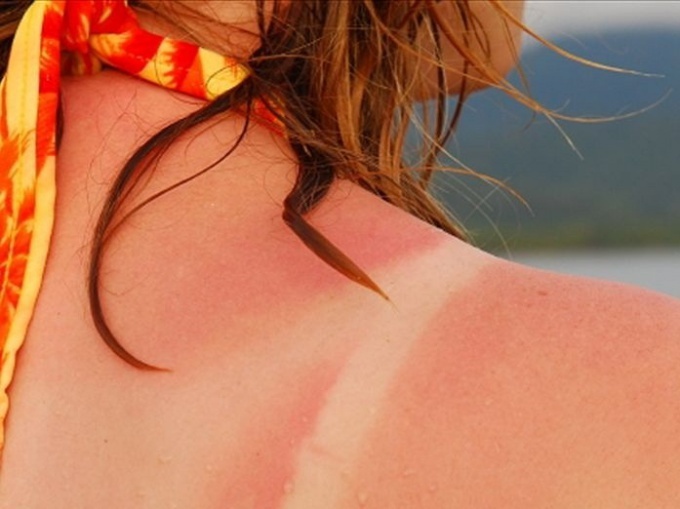 A skin burn is observed is exactly the same as with prolonged contact with direct sunlight. 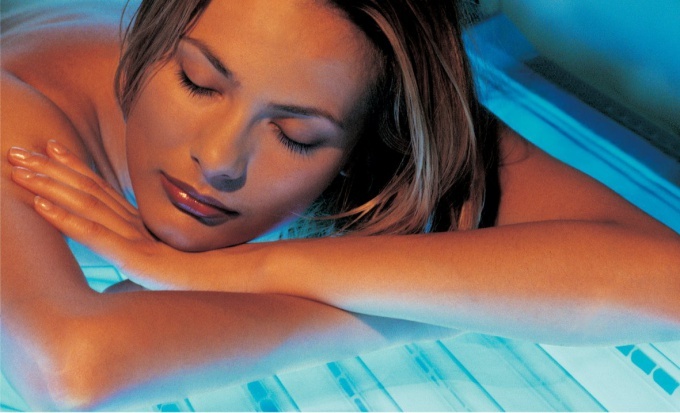 If after tanning redness persists for more than 2-3 hours, it is possible to say with certainty that it burns the skin. Feelings will be unpleasant: redness, the appearance of bubbles, the skin will gradually start to go down, also sometimes there is an increase in body temperature. To avoid these symptoms, the main thing - time to take action. The most common remedy - sour cream. Take sour cream any fat, but fatter than she is, the better. Lubricate the area of redness and wait after some time the redness will begin to subside. But there is one significant drawback - the smell. The sour cream will start to stink, so as soon as you will feel relieved, and the redness should go away, rinse it with body. Then apply any nourishing cream. Good help different oils. You can use any you have in your house: olive, sunflower, burdock and camphor even. Apply a small amount of oil on the skin, and after a few hours you will notice visible results. Olive oil can not wash away the rest of the oils, in principle, too, but if you don't like the smell, you can wash it off in the usual shower gel. Suitable and modern means, the benefit of a lot of them now. Buy any cream after sunbathing and use it. There are also creams that are designed to eliminate not only redness, but also directly burn. To apply the cream on damaged skin, but wash them and do not need. Have a pleasant smell and have a calming effect. If you notice clear redness after tanning, go home, while in the nearest pharmacy. Skin burns or redness after tanning - are not uncommon. The sensation is similar to sunburn. If you heavily exceed the duration of the procedure, the skin may blister, but if not, the redness will gradually fade, but will remain a brownish tan. To resolve the redness, use a hydrating and skin softening agents. Lubricate the skin with fat sour cream. Dairy products is enough to quickly relieve the redness and burning. After a short period of time, the redness will begin to subside. As soon as you feel better, rinse the cream from the skin, otherwise it will become smelly. After shower apply to the skin moisturizing or nourishing cream. If you have sea buckthorn oil, mix a generous helping of cream with a 5 ml oil and apply on the body. Sea buckthorn promotes healing of the skin and eliminates the burn. To cope with the burn and relieve the redness and will help other oils: sunflower, olive, camphor, or burdock. Apply on the body a little oil, lightly massage and wait until it will be absorbed. The procedure is repeated to complete discomfort 2-3 times a day. Of course, olive oil is superior to other, but if you don't have one, use any. Do not use too much oil, it will be very difficult to wash off even with using the shower gel, because reddened skin is impossible to RUB a washcloth. Go to the drugstore and look at the tools against sunburn. Buy any which fits your price. Use the cream according to the directions on the packaging, but not often. Such funds may be added to medicinal components, the excess of which can lead to poisoning. Do not exceed the average time of stay in the sunroom - more you will not tan, but burn just get. Before the first procedure, visit a dermatologist and consult on possible contraindications. Just before going to the tanning salon, apply to the skin funds with a high level of SPF protection. Good protect from the UV rays of the cream is created for toddlers, because baby cosmetic products of high quality, which cannot always be said about creams for adults. Bronze skin looks very attractive and seductive, so some people prefer to spend hours basking in direct sunlight, covered with a smooth tan. In this pursuit of beauty can is a gorgeous tan to burns in the form of redness. Try as much as possible to take measures to remove the redness. - sea buckthorn juice or oil. Of course, to prevent the appearance of redness after sunburn easier than then trying to remove it. Therefore, it is important to observe the basic rules of stay under the scorching sun. Always lubricate your skin before sunbathing special means of protection with a high SPF level. After-sun bathe and lubricate the skin with special lotion, cream or milk. To speed up the healing process of sunburn and reduce the redness, make use of the most popular and effective drugs. In the fight against redness of the skin become popular pharmacy products that contain panthenol. They have a pronounced cooling effect, contribute to the restoration and healing of skin cells. Such means are in the form of ointments, creams, and sprays. For whole body treatment it is more convenient to use spray. Ointment "Lifeguard" - a great tool for the treatment of sunburn. Its principal properties include antibacterial, regenerative, analgesic and calming effect on the skin. To remove the redness after sun exposure will help the juice of aloe leaves, which contain substances that contribute to inflammation and pain, and healing of the skin. Cut off a few aloe leaves, wash them and chop, squeeze the juice and lubricate the problem areas. If you have no home of this miracle plant, then you can buy in a drugstore gel or cream aloe-based. Use olive oil to combat sun burns. Apply olive oil is the first pressing on the affected skin, RUB in gently and leave until absorbed. If necessary, you can repeat the procedure again. Eliminates redness heavy cream or sour cream. Immediately lubricate the skin after taking a shower, you'll immediately feel the relief quickly subsides burning. After an hour, rinse the cream off the body and apply a moisturizing or nourishing cream, in which you want to add a bit of sea buckthorn juice or oil (this berry is perfectly struggling with sun burns). With the arrival of warm days, people tend to go to nature, to substitute the sun's rays on my body, not thinking about the possible consequences. In the end, the skin is burned, red and painful sensations are felt. Will have to put in a little effort to calm the skin and to get rid of sunburn. Anti-inflammatory drugs will help you reduce the likelihood of serious damage to epidermal cells and also reduce skin inflammation. The sooner you accept the drugs, the faster they will act. After sunbathing take a lukewarm or even cold shower, ensure the water was not hot, as this will only hurt the already burnt skin can lead to peeling and irritation. After tanning, your body needs hydration, so you need to give preference to detergents based on natural oils, which perfectly soothe the skin. After a shower, gently Pat the body with a soft towel, lubricate the skin cream-balm after tanning or baby oil. These funds are excellent calm the skin and help to achieve sustainable tan will help prevent peeling. Potatoes perfectly soothes the skin and helps fight sunburn. Take a medium potato, wash it and peel, grate on a fine grater, cool in the fridge. Then apply the potato paste to the burnt skin and keep for fifteen minutes. Sunburns heal fast, if you sprinkle the affected area with potato starch. The skin calms down, will accelerate the process of regeneration. Can be dissolved in water starch, to moisten the gauze and apply to the sore spot. Cottage cheese compress helps to alleviate the pain and cooling the skin. Take a double layer of cheesecloth, add cheese, wrap and store in the freezer. Apply a cold compress from cheese to burned skin. Don't let the wrap heat up. In the fight against sunburn copes sour cream. This is one of the best known remedies in folk medicine, which cools, moisturizes and reduces the burning sensation on the skin. Apply to burns to cool the yogurt or sour cream a few times a day. When the layer of dairy product dries, rinse it and apply a new one. You cannot apply this recipe in damaged skin or the presence of large blisters. Fresh cabbage leaves is another known remedy for sunburn. Cabbage leaves are perfectly calm the skin after sunbathing, ease pain and reduce swelling. Drench with boiling water the leaves so they become soft. Cool and apply to the burn, secure it with bandage. Change the cabbage poultice every two to three hours.